To find out more about the Bucephalus Horse also go to the above link, or see my page on this Blog. Available in many materials including stainless steel, 24kt gold-plated s/steel and pure .925 sterling silver. 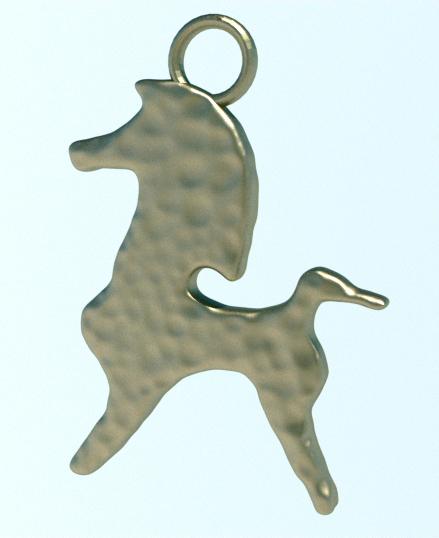 I am interested in buying 2 stainless steel Bucephalus pendants. If I try to buy it on Shapeways site it is way more than listed on this page. Please tell me how to buy directly from you. Certainly. I will email you with info. I would like to purchase the 2 stainless steel Bucephalus pendants and would it be possible to inscribe a name into it? I will email you with the details, thanks. its like i find it nice and beautiful… nice to have as a christmas… keep it up.. I don’t see where to purchase from here either. Very interested in purchasing one of the gold or silver pendants. Purchased your previous buchephalus statue for my wife and she loves it. Thanks for pointing that out, Chris. I have added the link to my Shapeways shop above. Thank you sir, just ordered 2 pendants for my wife for Christmas. I heart felt thank you for your art and the various Bucephalus pieces you do. The Black Stalion was her favorite childhood movie and she cherishes the Bucephalus statue you made as the most precious gift from me to her. Thank you. Have great Holidays and give a little something to http://www.HorseTales.org – or your favorite charity. can I still buy it? it still available? Hi Jessica, thanks for the interest. I will send you an email.